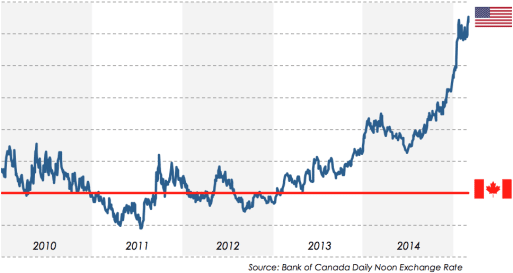 After a long period of relative stability and near parity, the Canadian dollar has fallen to about 80 cents U.S. – a six-year low. The outlook for further movement up or down, is unclear and is tied both to the general economic outlook for Canada and the U.S., as well as to worldwide commodity prices. Recruitment and pay issues for companies that hire executive talent from the U.S. If no adjustment is made for the low Canadian dollar, it will be even more challenging to recruit U.S.-based executives to positions paid in Canadian dollars. This applies to both cash compensation and to equity awards based on Canadian dollar stock prices. The competitive pay opportunities south of the border are now 20% more attractive from a financial standpoint, which may increase retention concerns. If pay is adjusted for the low Canadian dollar (either by converting and “grossing up” Canadian dollar pay, or simply by paying in U.S. dollars), then additional expense is incurred and precedents set. If different currencies are used for compensation among the senior leadership team (i.e., some executives are paid in U.S. dollars, some in Canadian dollars), then pay hierarchy/internal equity issues may be created. The issue doesn’t get easier in the longer term—the competitive disparity and the related challenges will remain for as long as there is a material currency gap. A company that has exclusively Canadian executives and primarily looks to the Canadian market for talent can likely hold the line and pay in Canadian currency. For other companies, the two obvious solutions (paying more in Canadian dollars or paying in U.S. dollars) both have an impact on the company’s compensation costs. Paying in U.S. dollars has the slight advantage that pay will move in tandem with currency movement, which is easier to explain and disclose, but has the disadvantage of exposing the company to a potentially increasing liability. Any consideration of currency adjustment should include an assessment of relative cost of living savings triggered by currency movement. If the currency gap persists over the long term, we expect that Canadian pay levels may start to climb (even for companies that use only Canadian companies in their peer group), as Canadian pay levels have historically been lifted by comparison with the U.S. Many Canadian companies benchmark executive compensation using peer groups or survey sources that contain both Canadian and U.S. peers. For several years, the exchange rate effect on U.S.-dollar denominated compensation could be ignored (effectively converting it at par, consistent with the actual exchange rate). This should not be the automatic methodology for 2015—instead, companies will need to carefully consider how to manage currency translation issues. 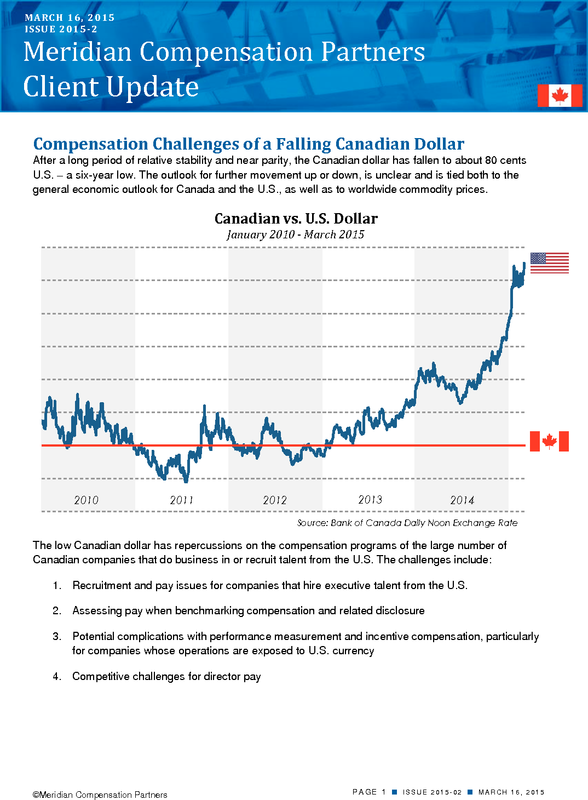 Simply converting peer company U.S. dollar compensation to Canadian dollars does not properly address the issue and can inflate compensation benchmarks. Analyzing the year over year changes in peer company pay levels without regard to exchange rate—to better understand market movement in making pay decisions. Reviewing benchmark data both with and without data converted to a common currency—to better understand the impact of currency fluctuations on the competitive landscape. This will provide a more nuanced analysis of pay levels and inform the discussion around how the company should respond in making its own pay decisions. Canadian companies that pay their named executive officers in Canadian dollars but disclose pay in U.S. dollars in their circulars will face an additional complication. Pay levels will change year over year, based not just on pay decisions, but based also on foreign exchange changes. 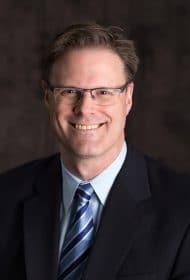 A currency driven increase or decrease in circular-disclosed pay may suggest a pay for performance alignment or disconnect that does not exist, both of which are of concern. Potentially unclear pay disclosure can be avoided by restating prior year data using the current year exchange rate for disclosure of historic compensation as well as for the current year. With currency “noise” eliminated, companies can focus on demonstrating pay for performance alignment and more appropriately reflect real year-over-year changes in compensation. Companies that do business (or purchase materials) outside Canada likely already face the issue of whether to adjust for foreign exchange fluctuations in the assessment of performance for incentive plan purposes. Some companies believe that exchange rate fluctuations should be neutralized completely because they: are outside management’s control; don’t reflect operating performance; and avoid the costs and risks of currency hedging (an effort-based perspective). Other companies do not make any adjustment on the basis that exchange rate risk is part of the business and can be managed through other cost-cutting initiatives or through a hedging program, so management should be accountable for a deliberate business decision not to hedge currency (a results-based perspective). Some companies will only adjust for foreign exchange differences that fall well outside of a historical range, or that impact the assessment of performance for incentive plan purposes. All of these approaches are defensible. Either way, the compensation committee should make a deliberate decision about adjustments for foreign exchange fluctuations preferably at the beginning of the performance cycle before there are real dollar implications. Committees should also understand the exchange rate assumptions used in proposed incentive plan goals. This requires the committee to be conversant with the budget and strategic plan documents that underpin the goals, at greater levels of detail than has perhaps been the case historically. With that said, in Meridian’s view there is a sound argument for neutralizing exchange rate effects that fall outside of a reasonable corridor around the assumed rates used in the proposed incentive plan goals, to allow for greater certainty and increased stretch in target setting. This is a place where compensation committee discretion can be applied to generate fairer outcomes. The issues with executive compensation arise even more clearly for director pay, as there are many U.S. resident directors sitting on Canadian boards. Many companies have already chosen to pay U.S. directors (and often other international directors) in U.S. dollars (paying a fixed number of dollars in U.S. currency, effectively allowing U.S. director pay to float with the U.S. dollar). As director compensation is significantly lower than executive compensation, the expense implications of exchange rate-related increases in pay are much smaller. However, the competitive issue is exacerbated by the current 20% gap (without currency adjustment) between Canadian and U.S. director pay. Click here to view a more in depth review of director compensation practices at large Canadian companies, and how they compare to the U.S. There will also be cross-border currency issues related to director Deferred Share Units (DSUs) linked to Canadian-issued stock prices. While the initial award reflects a currency conversion, U.S. directors are not protected from further Canadian currency devaluation. Given that DSUs (and other director share ownership requirements) are designed to align directors with shareholder interests, providing currency protection may be counter-intuitive. Where, however, a company’s shares are cross-listed, awarding U.S. director DSUs based on a NYSE or NASDAQ share price, seems appropriate. The recent fall in the Canadian dollar was unexpected and quick. Companies have already had to grapple with the impacts this has had on 2014 incentive plan payouts, in many cases without the benefit of a policy determined in advance to help guide decision making. The continued currency gap is likely to create more “noise” and to make target setting and the evaluation of results for 2015 more complex, emphasizing the importance of having a policy discussion to deal with currency shifts. Assessing competitive compensation opportunities is likely to become more challenging in 2015 and to require additional analysis to understand real market movement.